When my husband and I were newlyweds, we started acquiring Christmas books, children’s books, mostly. We add a new one to the stash each year or so, and when the tree trimmings come out of storage, so do the books! 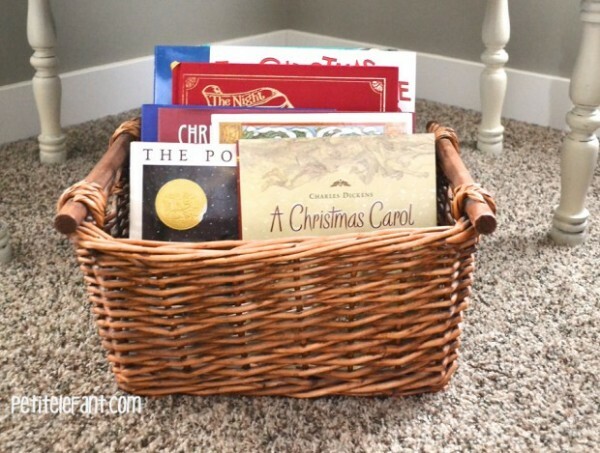 I’ve read that some families wrap their Christmas books in festive paper and open one each night in December leading up to Christmas, but we prefer to put our collection out in a basket so all the books can be enjoyed all month long by the whole family. Less tape that way. 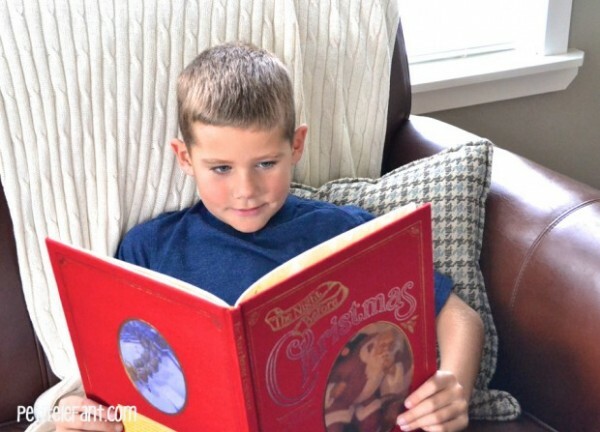 The classics are all there of course–the Grinch, the Polar Express and ‘Twas the Night Before Christmas–but I’d love to share some of our other favorites with you today, in no particular order, for kids from one to ninety-two. We have 3 versions of this book, actually, because it’s that dear to my husband and my little boys. We’ve shared the original and the children’s version with them with equal success. It’s definitely worth an annual read. Note: my kids also love the old radio dramatization featuring Lionel Barrymore. 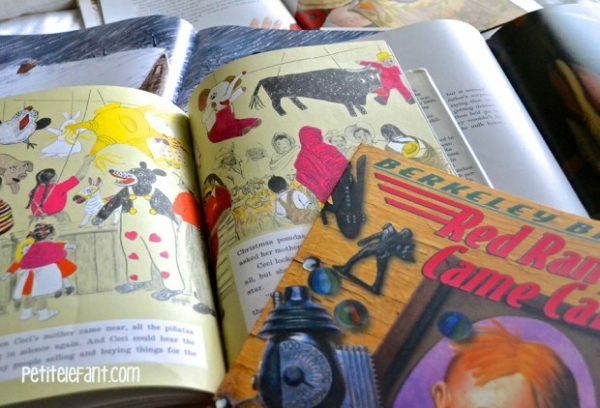 This story is simple and tender, and a sweet reminder about the gifts that matter most, and just what you’d expect from a master like Buck, even if it is a picture book. When I was in first grade, I chose this book to check out every time my class went to the library. I think that big shiny yellow pinata is what hooked me. It’s been in and out of print, but my husband found a used copy for me several years ago and now my little boys enjoy the pictures of all the pinatas at the old Mexican market, and learning about a little girl’s first posada. Fannie Flag is pretty fantastic at creating memorable characters and charming stories set in the south. This story is no different–quirky and touching. This would make a great little stocking stuffer or last minute gift for any mom, neighbor, sister, cousin, etc. The illustrations are beautiful, and its message is, too: even Santa knows there is more to Christmas than Santa himself. Any fan of Polacco ought to include this book in their library. I love the underlying theme that one little setback or stroke of bad luck can actually snowball into one giant miracle. This one is just a little bit different from the other children’s books we’ve found. It’s tender and comical and quirky. I especially love the illustrations and the fantastic descriptions. A few others worth mention: Apple Tree Christmas, Christmas Cookie Sprinkle Snitcher, Too Many Tamales. 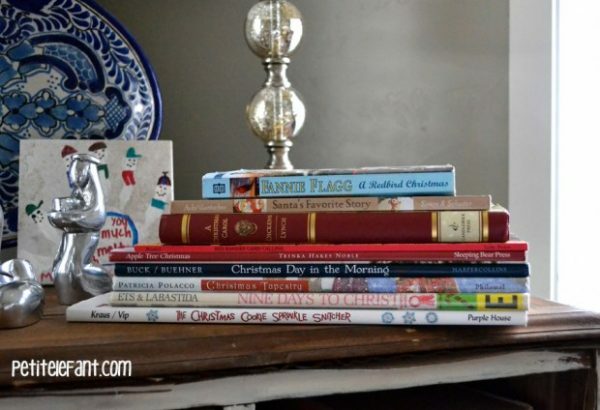 Do you collect Christmas stories and books for your family? I’d love to know some of your favorites. Yes yes yes to your list! We also love “Olive, the Other Reindeer,” and this year “The Christmas Wish” by Lori Evert and Per Breiehagen. It’s gorgeous, you’ll love it! Amelie, “Olive” is in our basket, also. I’m going to check out your other suggestion. Thanks!